Post-Kavanaugh, momentum seems to have shifted. A few weeks ago, most pollsters predicted that Dems would win a Congressional majority and that they stood a shot at taking the Senate. That picture seems to have changed … quite a bit. RealClearPolitics is a down-the middle source that reports several polls-of-polls. 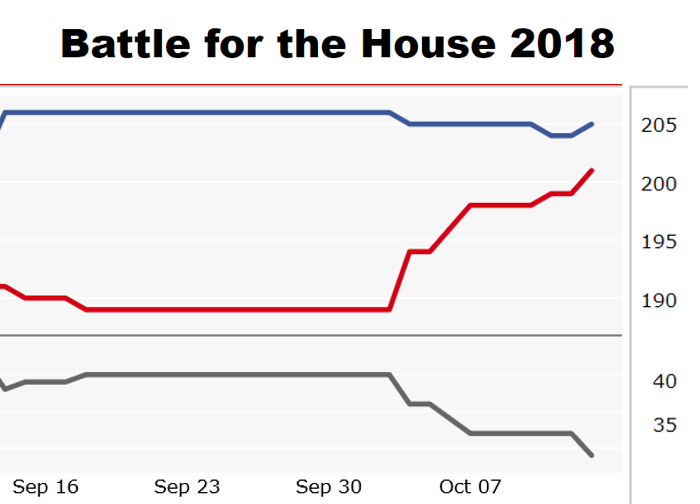 One tracks Congressional races, slotting them as likely Dem, likely GOP or toss-ups. It takes 218 seats to control the Congress (which has 435 representatives). A couple of weeks ago, RCP was reporting 206 seats as likely Dem, 191 likely GOP and 38 toss-ups. Now, the RCP recap is Dems 206 and GOP 199 … with 30 toss-ups. The Dem “hard” advantage has narrowed from 15 seats to 7 … with most of the GOP gain coming from the toss-ups (note the near mirror image of the GOP and toss-up lines).